A little more than half of all U.S. refinery capacity is located in the U.S. Gulf Coast region. 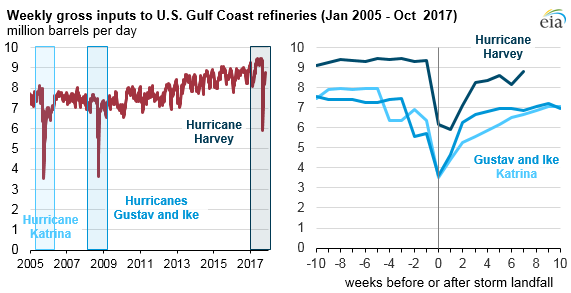 Texas, where Harvey made landfall, represents 31% of all U.S. refinery capacity according to data from January 2017. Gulf Coast refineries supply petroleum products to domestic markets in the Gulf Coast, East Coast, and Midwest, as well as to international markets. Click here to read the full article from U.S. Energy Information Administration.